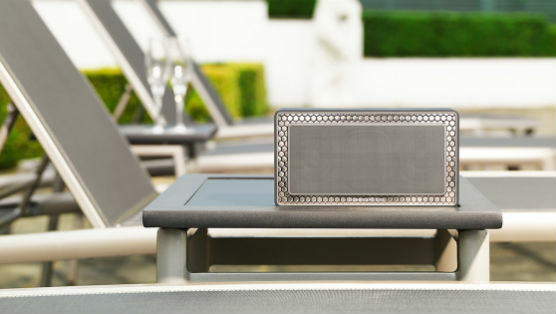 If anyone was concerned there wasn’t a Bluetooth speaker made precisely for their unique circumstance and situation, Bowers & Wilkins has crafted another and placed it into the world. The T7 model is a small, manageable, speaker which has a lot to offer. It also demands a lot in return, in the form of cash. At $349, the Bluetooth speaker is definitely a conscious purchase. But are its sound and features worth the cost? The promo pictures make the T7 look bigger than it actually is. In reality its a handheld size which could easily be thrown into a bag or find a spot to bring along most places. There isn’t anything about the speaker that’s specifically designed for travel, however. The speaker has a smooth rubber finish along the perimeter. This is mostly for ascetics and feel. The front and back of the speaker are covered with a metal grill. Where the design differs from other speakers—not just Bluetooth speaker either—is the clear honeycomb pattern surrounding the speakers. The honeycomb pattern isn’t just a design element, it’s meant as a functional cushion to keep the speaker from rogue vibrations. More and more, little speakers are able to produce big sounds, but it’s often to much for their frail hardware to contain. The T7’s floating speaker design is an answer to that problem. As far as the speaker’s exterior goes, there aren’t a lot of frills. There’s volume up and down buttons along with a play/pause and Bluetooth connection buttons on the top. There’s also a power button along the side, all of which lay flush and aren’t noticeable. It’s not just the exterior that’s fairly plain, the speaker is pretty much just a speaker. I’m not a person who needs their Bluetooth speaker to also include every feature under the sun—cough, Creative Soundblaster Roar a few extras would be nice beyond the lone aux input. For example, both Creative’s speaker and the new BeoPlay A2 from Bang & Olufsen feature a USB port for charging your device while listening. A lot of Bluetooth speakers also function as a speakerphone. Again, these extra features aren’t necessarily the point of a Bluetooth speaker, but B&W’s T7 loses pretty quick in a straight feature for feature comparison with the competition. One thing the T7 does do is get loud, almost impossibly so. The tiny TK-inch speakers and bass module don’t seem capable of producing the level of volume which they do. Even more than just straight decibels though, the Bluetooth speaker is able to keep its composure at the loud volumes and doesn’t distort which makes the top levels actually useable if the party circumstance is right. I never was able to get myself to test the limits of the speaker, not because I thought the speakers would blow, but because I was afraid of complains from the neighbors. It’s the type of situation where—when cranked up—you can tell what song’s playing in a closed room from the other side of the house. The sound quality, whether at the upper levels or at normal listening levels remains fairly even keeled the entire time. The T7 is steady and doesn’t veer much from its first impressions. The T7 sounds great, crisp and clear, but it does lack the booming bass. In fact, the overall sound lives on the higher spectrum and skirts the low end. Despite its good sound, it’s never unbelievable. What I mean is that the music always sounds like it’s coming out of a small rectangular box. Comparatively, the Bose Soundlink Mini produces full sound that goes way beyond its small container. Similarly, Creative’s Soundblaster Roar provides more low end which gives it a fuller sound—even if it doesn’t actually sound better, it gives off the impression that it does. At low volumes the T7’s distinct clarity is still preferred over a muddier sound. For better or worse, what you see (and hear) is what you get. There’s no software component to the T7, no companion app. That means that there’s currently no way to tweak the EQ or adjust the sound beyond what your mobile device provides, or the use of a separate third party app. Bowers and Wilkins have done a great job crafting a Bluetooth speaker that can get loud and handle itself accordingly. The unfortunate part is that’s pretty much the only differentiating feature you get for your $350. Someone willing to lay down that type of cash for a portable Bluetooth speaker may not care that there aren’t more bells and whistles. In which case, the T7 is a solid choice for the right person. The average consumer, however, will most likely deal with the vibrations and rumble from another less expensive speaker.